The TMNT are onboard a blimp, traveling to Central America after a devastating storm has crippled much of North and South America. The Turtles are accompanying Colonel Blade, who is using the dirigible to bring relief supplies to those affected by the storm. Upon landing and unloading, Blade receives new instructions from the local ambassador: he's to travel to the Abecero Peninsula and restore contact with a missing research team. 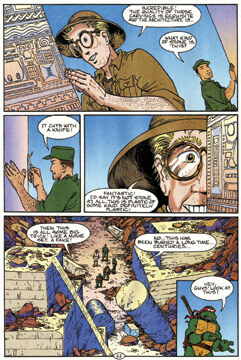 Joining the Colonel and the Turtles on the mission will be archaeologist Professor Daub. The ambassador explains that they haven't heard from the researchers since the storm hit. The area they were located in is considered to be haunted by the local people, so it's very remote and unpopulated. The politico then tells Blade that this mission is top secret, and the Colonel should take pains to shed as little blood as possible in relocating the research team. 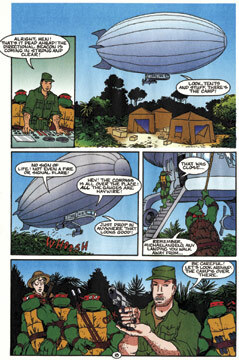 Fully briefed on their task, Blade, the TMNT and Daub board the blimp and head off. 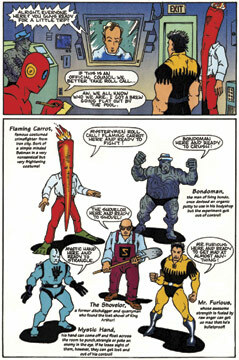 Meanwhile, back in the USA in the secret headquarters of the Mystery Men, the team of unusual heroes (Flaming Carrot, Bondoman, The Shovelor, Mystic Hand, Star Shark, The Zeke's, the Spleen, Screwball and Mr. 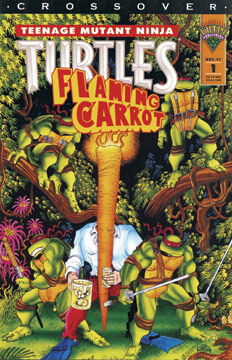 Furious) is called into action to find the same research team that the TMNT and Blade are seeking. We learn that the missing scientists had discovered the "Lost City of Botaquaxal," a renowned city of ancient sorcery, science, culture and wealth, long thought to be a legend until recent events. The last transmission the researchers sent had a warning about "walking Green Fire" and a warning: "Do not come here! Do not send help! Nuke this place! Bomb this place off the map!" Undaunted by the dire message, the Mystery Men head out. The Turtles arrive at the base camp of the lost researchers and discover half-eaten breakfasts. Leo surmises that whatever happened, it caught the team by surprise. No items have been stolen or harmed, but there's no sight of the missing scientists. Don and Leo are alarmed because all is silent - not a peep out of anything, not even an insect, and they're in the middle of a jungle. Back on the Mystery Men's plane, the Shovelor points out a bizarre weather anomaly - the killer storm that had caused so much destruction didn't originate from the usual spots, it had come directly from the Abecero Peninsula - the very spot that they're going to investigate. Professor Daub, Blade and the Turtles are now exploring the strange ruins of Botaquaxal, that are made out of a strange form of plastic rather than stone. There are many structures, but none of them have any apparent entrances. Mike spots another structure emerging out of the sea and Professor Daub spots an open doorway on the roof. The guys decide to investigate, once they've had lunch. Professor Daub examines photographs taken of the writing on the buildings and determines that it's not of Mayan or Aztec origin. He also states that the material the structures are made of is probably "not of this earth." Don discovers the scant remains of one of the researchers in the jungle. It appears as if the scientist had been disintegrated, practically nothing remains save for his fillings! The guys decide to camp for the night and investigate in the morning. Leo takes first watch and Mike has strange dreams of unusual people - when he's suddenly awakened by Leonardo's tale of spotting a small creature made of green fire. As Leonardo explains his sighting, the Green Fire arrives at the camp site and Blade fires at it. 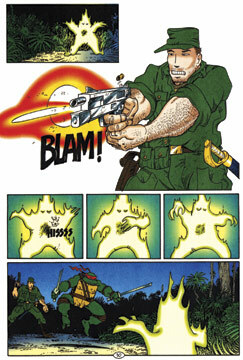 The strange beast seems immune to physical damage at first, but Don tells the Colonel to fire into the Fire's chest, which is marked by a dark circle. This shot is effective, as the creature pops like a balloon and disappears in a fiery, green blaze. Professor Daub is upset that the guys killed the creature, but Leo insists that "It tried to eat my head!" Don notes that its behavior had been infant-like - and that they should have tried to communicate first. The Mystery Men. TMNT, Daub and Blade. Interesting ruins. Firing at the Green Fire.